At the end of Secret Blois #1, I left you in Place Louis XII, the most animated part of Blois and home to a twice-weekly fresh produce market. You may have noticed a certain uniformity in the buildings around you. During World War II, Blois was occupied by the German army which invaded the city on 18th June 1940. It was liberated by American soldiers during the last two weeks of August 1944. On both occasions, the town was bombed for several days particularly after the Normandy landings, destroying more than 1500 buildings, especially in the area around Place Louis XII, the railway bridge over the Loire and Gabriel Bridge. The château was saved by a pragmatic decision taken by the local authorities. The German bombs started fires in the city and the chateau was in danger so some of the mediaeval houses around the chateau were deliberately blown up by the locals to form a firebreak to protect the château. The Germans were aiming for the bridge in order to stop people fleeing south. In those days there was a steady stream of refugees crossing at Blois and other places. However, if you continue along the narrow street of Rue Saint Lubin keeping the Loire on your left and the castle on your right, you will find yourself in a much older area dominated by the 13th century Romanesque church of Saint Nicolas with its tall spires. Follow Rue des Trois Marchands noting all the little speciality shops along the way, many of which are on the ground floor of half-timbered houses that fortunately survived the war. Continue along Rue des Trois Marchands to n°11. Initially called Auberge du Cigne, this inn, which was built in 1573, became Auberge des Trois Marchands in 1669 and gave its name to the street which was full of hostels and inns: l’Ecrevisse (opposite the pharmacy at n° 17), La Fontaine (the site of the Tuile d’Or, today n° 19), La Croix Blanche (n° 21) and many more which have now disappeared. On the right of the church of Saint Nicolas when you are facing the entrance, you can see a fountain built into the wall of the cloisters of the old Saint Laumer Abbey. Foix or Saint-Laumer Fountain was the only one not supplied by the Gouffre, a reservoir gouged out of rock to which a 529-metre long aqueduct brought rainwater and seepage water collected on the limestone plateau. The Gouffre is at the bottom of the staircase called Degrés du Gouffre which we will visit on another occasion. This is the third fountain we have seen so far out of the seven that still remain in a city once renowned for its “glorious fountains” to quote the historian Noël Mars, writing in 1646. On the next corner on the right is the Musée de la Résistance, another reminder of Blois’ war history. Turn right in front of the Auberge Ligérienne Hotel and onto Place de la Grève to find the best-known and most elegant place to stay in the 17th and 18th centuries: Hôtellerie de la Galère. At that time, it was right on the quay, near the old river port of Grève. at 3 place de la Grève. It was first mentioned in 1611 and finally disappeared in 1825. Its illustrious guests include Nicolas Fouquet (Louis XIV’s finance minister who got too big for his boots and built Vaux-le-Vicomte), Madame de Sévigné, James II of England, Philippe V, the Prince of Wales in 1711, Mehemet Effendi and the Spanish Infanta. Sadly, all that is left today is a window with a balcony and a carriage entrance at 6 rue de la Grève. Back on Place de la Grève, turn left to walk along the river towards Pont Gabriel bridge and past Saint-Laumer Abbey which now houses the region’s administrative offices. A little further on, on Place Jacques Lob, you’ll see a building with two comic characters on the front – La Maison de la BD. A BD is a bande dessinée ou comic strip, an art form that is extremely popular in France among both children and adults. Blois holds a comic festival every year called BD Boum. This year (2016), it will take place on 17 and 18 November. The characters, Bill & Boule, first appeared in a Belgian comic book called Spirou in 1959. If you take a short deviation left into Rue des Jacobins on the left, you will see the front entrance with a drawing by François Bourgeon. Millions of copies of Bourgeon’s albums have been sold. He’s particularly well-known for his heroines. The BD centre runs temporary exhibitions and comic strip classes for teenagers and adults. Back on Quai de la Saussaye, you will come to Square Valin de la Vaissière on top of an underground parking lot. A black marble monument to Colonel Henri Valin de la Vaissière on the edge of the square closest to Place Louis XII is yet another reminder of World War II. Born in 1901, Vallin initially trained as an air force officer. After his unit was disbanded in 1942, he joined the ORA (Organisation de résistance dans l’armée) where he was known as “Valin”. Unfortunately, he was assassinated by a deranged subaltern in December 1944, after a regiment of Resistance fighters under his orders expelled the Germans from their barracks and liberated Blois on 16th August 1944. Before the Germans left, they decided to blow up Jacques Gabriel Bridge which you can see on your right. Two piers and three arches collapsed but the rest of the 18th century bridge resisted. The only way that the daily traffic of 1000 vehicles and 4000 pedestrians could cross the river was by ferry. As a result, a temporary wooden bridge was built in less than 3 weeks. It was used for a year while a second wooden bridge capable of carrying greater loads was being built next to the stone bridge. Despite enormous problems– flooding, lack of materials, very cold weather, etc., construction of the second wooden bridge began during the winter of 1944 and was completed on 2nd September 1945 on the 1st anniversary of the total liberation of the city. The new bridge was pronounced safe by the engineers but vehicles were asked to limit their speed to 15 kph and only trucks under 10 tonnes were allowed to cross. After three years of good and faithful service, the wooden bridge was finally replaced by the newly reconstructed stone bridge. If you cross over to other side of the road just to the right of the bridge, you can see the remains of the wooden bridge during low water periods next to the central arch. Cross back again and turn left just after the Société Générale bank into Rue Emile Laurens. Take the first street on the right, Rue du Commerce, the main shopping street of Blois. On the first corner, you’ll see a couple of half-timbered houses that miraculously survived the Second World War. At the top of Rue du Commerce, turn right into Rue Denis Papin and you’ll see a sunken fountain on your right on Place du Marché au Beurre, once the butter market. The original street level has now been raised, and the fountain is partially hidden by the terrace of the Saint Jacques Restaurant. It was given to the town by Louis XII under the somewhat uninventive name of “Neighbourhood Well Fountain” and renamed Saint-Jacques Fountain after a collegiate church that has now been destroyed. Since its construction, it has been fed by the Gouffre mentioned above. That is our fourth fountain. The fifth is located further along Rue Denis Papin just before you get to the corner, on the opposite side of the street almost at the foot of the stairs. It has an interesting history. 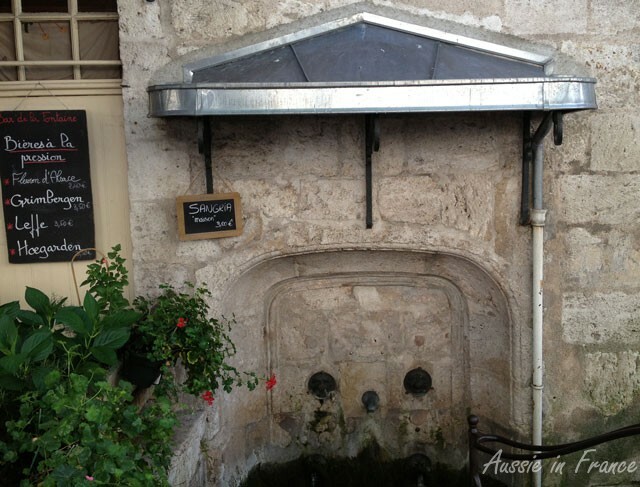 Called the Hôtel de Ville (Town Hall) Fountain, it used to be located on the wall of the old 15th century town hall, on Rue Foulerie. which was destroyed in June 1940. The fountain was found among the ruins and kept in the Lapidary Museum across the river in Vienne until a local historical association, Association des amis du Vieux Blois, financed its re-installation at the foot of Denis Papin stairs in 2005. Now walk down Rue Denis Papin towards the river, staying on the right-hand side. You’ll come to three enormous metal keys on the corner of Rue des Trois Clefs (Three Keys Street), so named because of the many locksmiths who had their shop fronts on this once narrow street, widened after the 1940 bombings. It was in 1979, when the pedestrian precinct was created, that the municipal workshops produced the monumental metal sculpture consisting of three keys, 3 metres high and each weighing 420 kilos, in less than three months. We’ve come to the end of our second tour of Secret Blois. Next time, we’ll cross Denis Papin and explore another old quarter of Blois with its many mediaeval façades, winding streets and staircases. If you’re looking for something to eat or drink close by, you can go to Appart’Thé for tea/coffee or lunch at 12-14 rue Basse (Rue Basse forms a triangle with Rue Denis Papin when it turns the corner), dinner or lunch at Au Coin d’Table, 9, rue Henri Drussy or for lunch, dinner or a drink at Le Douze which is a cellar, restaurant and wine bar, Place Ave Maria, 12 rue du Poids du Roi, or F&B opposite, all of which are on the other side of Rue Denis Papin. This entry was posted in Architecture, Blois, History, Sightseeing and tagged secret blois, walking tour of blois, what to see in blois. Bookmark the permalink. At least some of this isn’t the typical sort of material you’d find in tour books. The three keys sculpture particularly stands out to me, as does the death of de la Vaissiere. I often use the Valin de la Vaissière car park and was interested to discover who he was. Did you know that the chateau was saved during the German bombing of the city in 1940 by a pragmatic decision taken by the local authorities? The bombs started fires in the city and the chateau was in danger so some medieval houses around the chateau were deliberately blown up by the locals so that there was a firebreak to protect the chateau. The Germans were aiming for the bridge, to stop people fleeing south. During those days there was a steady stream of refugees crossing at Blois and other places. Great post. I can see the time and research that has gone into it. No, I didn’t so have added the information to the post. Thank you.